I think there very well could be a “perfect analogy” in this, but it’s not the one that Elder Ballard described. It’s interesting that it was a building project on BYU campus apparently that caused the aquifer to shift such that this tree was deprived of living water. In this perfect analogy, Elder Ballard doesn’t seem to notice that the “…one reason or another…” that the dead sequoia was disconnected from the living water offered by Jesus Christ was not because of its own actions, but because of someone else’s building project. Indeed, the cares of the world can choke the word that it finds no place in us. We should be careful who we trust to be our leaders, teachers and examples of righteousness. I reside within the region privileged to hear from a Prophet, Seer, and Revelator. I attended with a prayerful hope of hearing the Lords warnings, after all, things aren’t very rosy with the US and global economy, the Iranian nuclear deal, ISIS, etc. I expected to hear the Lords spokesman tell us to pray more fervently, be more humble, take better care of our poor, hungry, and needy neighbors; instead, a Gallop poll of praise for Happy Valley (Provo/Orem) and the bread-basket of the missionary program (Utah in general) left me numb. I get so much more from my online studies with like-minded seekers of truth; but that very thing was part of his warnings. I hope you, Rock, Tim, Adrian, Denver, and many more wonderful brothers and sisters keep sharing your impressions and promptings. You are feeding HIS sheep; thank you. It is interesting how some of the Brethren have addressed their concerns that some members are looking beyond the mark in their spiritual moorings, rather than following the Brethren, as Elder Oaks stated in his Boise Rescue talk, “if we stay with and follow the current leaders of the church we will receive salvation and eternal life.” I thought salvation was only possible through the Atonement of Jesus Christ and not by man. Jesus taught, “Thou shalt love thy neighbor as thyself.” If we are His disciples, we must practice Christian civility and kindness to all we meet, including those who have chosen to disassociate themselves from the Church. Let us join hands with all people of goodwill in every good cause and include them in our circles of friends and associates. Let us truly welcome them into our chapels and ward activities. I wonder how many church members will be willing to apply what a “prophet” has taught them concerning civility towards those they esteem as “apostate”. I talked with a member who is seeking to follow Christ and asked how her journey was going. She remarked, she has felt shunned by the ward. A member was behind her in a checkout line, and she was going to talk to her, but the member turned her back, and then moved to another checkout line. I find it odd how members will go out of their way to talk and try to rehabilitate a less active that is attending another church, but will avoid like the plague someone they feel is apostate. It is like they have written them off with no hope. There is this stigma that has spilled over from the Zoramites and the Rameumptom days that has taken root in the church, and that is, those who never question anything taught or spoken at church are somehow more valiant and special than those who taking seriously the quote from another “prophet” Harold B Lee. So in essence, when good faithful members have questions regarding shifting and changing doctrine or policies of the church, and try to justify that in a scriptural context, they are mocked and fingered as apostate rather than fellowshipped or included in the body of Christ. It really makes me wonder how much we as Mormons take seriously our scriptures. Do we just read them to check a box on the list and not allow these words to sink deep into our souls, or do we just gloss over them because certain passages might make us look hypocritical or ignorant in our understanding of certain topics. After all, if the Gospel Doctrine teacher can’t flesh it out, than how are we supposed to, right? I really appreciate your posts Anonymous Bishop and want to say happy anniversary on your 1st year of blogging. You have been a breath of fresh air as your unique perspective brings additional light to many issues. Keep up the good work, looking forward to another interesting year in our Lord. Good commentary, Bishop. I couldn’t finish this rather stale address when I downloaded it, it was just so tepid and toothless. My understanding is that Ballard is on the far end of the speechwriting spectrum, meaning, he among many other authorities in the church relies very consistently upon someone else to compose his addresses. Yes, all is well in Zion, can’t you see how robust the ambient network of economic and church connected people are? This has to mean something mighty has been done that we can praise the church for. Hmmm. Wow, a prophet, seer, and revelator and expects God to be silent concerning the obscurity of our narrative? Is that clear from his address? Really? I raise my warning voice, as Paul did, that there are those “that trouble you”—people that “pervert the gospel of Christ.” I would be shirking my duty if I did not raise my voice to warn you of the challenges we face today. I remind you of Jesus’ prophecy regarding the last days in which we now live: “For there shall arise false Christs, and false prophets, and shall shew great signs and wonders; insomuch that, if it were possible, they shall deceive the very elect.” We are saddened when we witness some of the “very elect” deceived as Jesus warned. Recently I visited a small grove of sequoia trees planted years ago on the BYU campus not far from where this broadcast is originating today in Provo…. Sadly, one of the trees died last year; and the dead tree needed to be cut down, leaving only a stump to remind anyone passing by that a tall, majestic tree once stood there. The campus Arborist wanted to know what killed the tree, as the sequoia certainly did not die of old age. After an examination, he determined that the tree’s feeding roots had died from a lack of water…. The Arborist discovered that the aquifer that nourished the little grove had shifted as an unintended consequence of the construction of the new Life Sciences Building, just east of the grove. To me this is a perfect analogy of what happens when stalwart Church members, the “very elect,” those who for all appearances seem to stand tall and erect in the faith, but die spiritually. Elder Ballard then explained how, in his opinion, it is our negligence of the basics that allow the “very elect” to slip away and forget the fundamentals of the gospel. I couldn’t agree more. I wonder if Elder Ballard detects the irony of his words? Let me explain. Paul’s words apply wonderful to the restoration of the gospel through Joseph Smith. God made very clear in the verses of the Doctrine and Covenants that the restoration came through Joseph Smith. Church materials support this argument. However, church history, for those who study it, provides an interesting story very similar to the story of this tree. Instead of confiding in what Joseph did, and making our mission the fulfillment of God’s word through him, we’ve built what seemed like good projects, like Life Sciences buildings, and accidentally moved the aquifer away from the roots. As a church, have we stayed “focused on the simple doctrine and gospel of Christ”? Have we embraced the restoration through Joseph Smith? Or, are most members today as ignorant to exactly what Joseph taught and what God commanded through him as non-members? Have members listened to “false teachers and self-declared prophets” and replaced God’s word with “worldly philosophies”? I suppose we could measure by the liveliness of the tree. Or, as in Jacob 5, what fruits the tree bears. -A nationwide polling service found Utah to be the most religious state. I don’t think that any of these things are bad things. Yet, I am aware of many people (including scriptural examples like the Israelites and King Noah’s people) who were able to produce these fruits without having any connection to the tree of life. In fact, these are all measurements not of how close you are to God, but how much money you have. After all, you can buy anything in this world with money. I would hope that stronger fruits would be miracles, visions, prophecy, revelation, visitations, and other fruits that witness to a person and a group that they are accepted of God. Elder Ballard said: “There is absolutely nothing wrong with asking questions or investigating our history, doctrine, and practices. The Restoration began when Joseph Smith sought answers to his sincere questions.” I’m really happy to read him saying that. He correctly identifies that many leaders (local and otherwise) are persecuting members of the church for the crime of knowing more about church history than they do. That’s a shame, and I hope Elder Ballard’s words helps smooth this over. Elder Ballard railed a bit against the tendency for members to use the internet in their searches regarding church history. He said, “It is hard for me to understand why anyone turns to other voices on the internet without first turning to voices of the scriptures or the voices of the living prophets and apostles.” It is kind of hard for me to understand why this would be hard for him to understand. The church has a solid track record of intentionally misleading church members on history. Unlike some, I do not believe this has been an intentional effort. Rather, I believe that church leaders have generally been woefully ignorant of church history, simply as a result of having spent their time on other things. 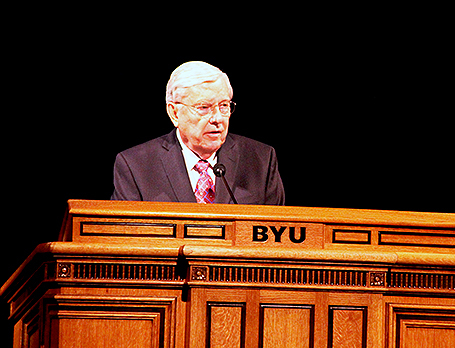 Brother Ballard admits that his resource for answering questions are church paid historians and BYU professors: “When I have a question that I cannot answer, I turn to those who can help me. The Church is blessed with trained scholars and those who have devoted a lifetime of study, who have come to know our history and the scriptures. These thoughtful men and women provide context and background so we can better understand our sacred past and our current practices.” He is not the first apostle to admit that he didn’t know church history. President Packer explained that one reason they have the correlation committee (a paid group of scholars that edit and filter church materials for correctness) is that they fully expect the correlation committee to know more about the gospel and church history than they do. Now, only a fool would expect a committee of church employees to report the full historical story to their bosses without some sort of pro-current-positions filter in place. So, effectively, the only thing church leaders know about history is what reaffirms the policies and positions they have put into place without knowing church history. Now, all of the sudden, many things make sense: The blatant contradictions between official policy and church history, the glaring omissions in the church’s recent “Gospel Topics” essays, the perpetuation of faith promoting rumors that are historically falsifiable, etc. In that vein, Elder Ballard’s point about how we should not be “Viewing podcasts and Internet sites that raise questions and doubt without being intellectually honest and that do not adequately and honestly present the Lord’s perspective” takes on another light: This would necessarily include all official church materials. A friend of mine reminded me a few nights ago about how these guys Ballard, Oaks et, al. sound like unfrozen caveman lawyer from SNL in the early 90’s. I wonder if mention of Denver Snuffer’s name makes Ballard sometimes “want to jump out” of his BMW and run into the hills? Just went through the Zoramite story recently.Never made that connection. Thanks for articles Anonymous Bishop. They help me substantiate my claims, and speculation that I had. And also prove my point to others that I am not crazy, or apostate. I am convinced that hardly any members ever read the scriptures anyway?? They never have even a modest, compelling argument. “You are just off the reservation”they say. It scares them to there soul to question anything!? Church,9/11,or any other conventional wisdom?